Generating traffic to an ecommerce site is helpful only if that traffic produces sales. 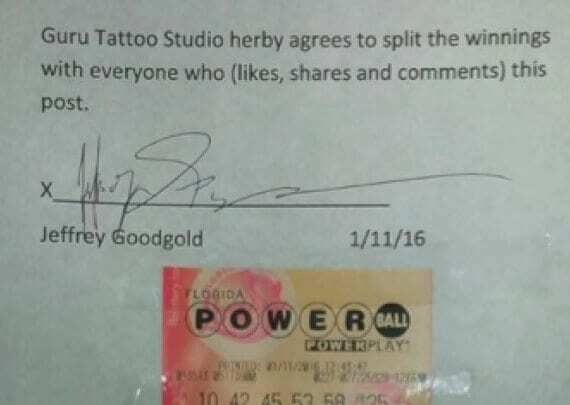 A tattoo company in Florida created much worldwide likes and shares with its Powerball-winnings offer. But it likely produced no customers. When the Powerball lottery hit $1 billion, a company had a brilliant marketing idea. It spent $20 on a lottery ticket and offered to share the winnings with anyone who liked, commented, or shared a post that contained the ticket numbers. The post received over 500,000 likes and nearly as many shares. I became aware of it when someone was touting the “astronomical” return on the $20 ticket. Sadly, the real return on investment might have been closer to zero. The business that was being promoted was a tattoo parlor in West Palm Beach, Fla. The likes and shares came from all over the world. They were not correlated to the underlying business. It’s very probable that not a single person altered his behavior to travel to this place because of this single viral post. This underscores the importance of setting up the proper goals to measure activity on websites. Measurement strategy is the first step of any good analytics program. The end goal of any ecommerce site is presumably to sell product. Nearly every other metric we can choose is merely diagnostic toward that end. A pyramid of metrics illustrates the best measurement strategy. 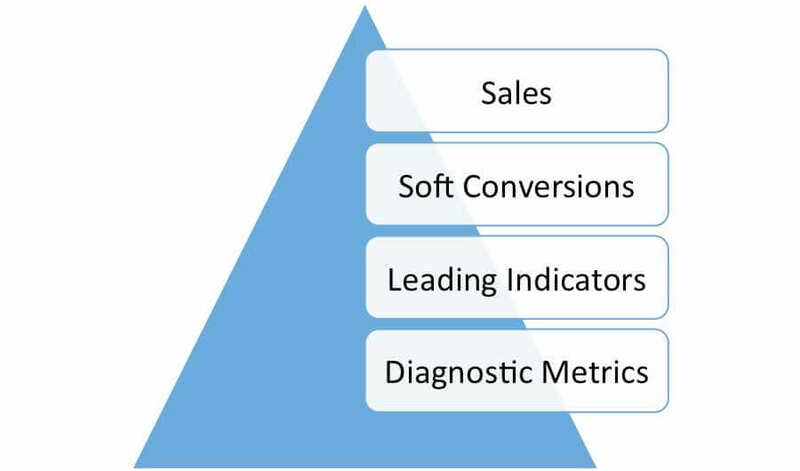 A pyramid of metrics — Diagnostics, Leading Indicators, Soft Conversions, Sales — shows the best ecommerce measurement strategy of ultimately selling more product. The pyramid model is meant to represent the relative number of metrics to monitor to achieve the ultimate goal of more product sales. This model helps prevent drowning in data. In the coming months, I’ll dive into each one of these metrics in detail with a focus on Google Analytics and implementation. A second part of any good strategy is that actions can be generated based on these metrics that will help the business. While very often these come from understanding the deeper metrics, changes in the high level metrics can set up very powerful plans. In this post, I’ll address some of the strategies at each level of the pyramid. Sales might seem to be the simplest metric, but done properly, it’s more than just the raw number of dollars generated. One other key metric to consider is the revenue generated per sale. Monitoring this metric can strongly influence ecommerce success. If the number of sale transactions is high, but the revenue per transaction is low, employing tactics to grow basket size are in order. 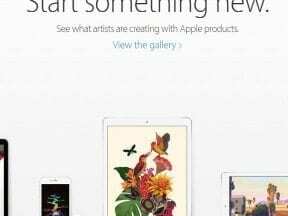 If the reverse is true, plans can be put in place to reduce sale friction — such as discounts or cart recovery. It’s also easy to forget about the effect of returns on sales numbers. If returns are growing, it could be more than just product problems. It could be on-page copy setting up unrealistic expectations or marketing to the wrong types of users. Soft conversions, such as account creation or newsletter signups, can be an easy metric to forget about. Not everyone is ready to purchase on his first visit. Keeping her in the system with an easier conversion can lead to great things. However, it’s important to consider how often soft conversions become sales, and the time that this conversion can take. Ideally, these soft converters should be added as a new marketing channel and tracked accordingly. It’s possible to see how the sales behavior of soft converters is different from those that are not. Oftentimes, soft converters will have higher cart values per sale, or otherwise purchase more often than others. However, sole focus on soft conversions can lead to warped marketing. Soft conversions are gateways, not the end goal. In the example of the tattoo parlor, likes are an easy-to-garner soft conversion. But the like from a user in California will probably create zero end value to a Florida-based business. 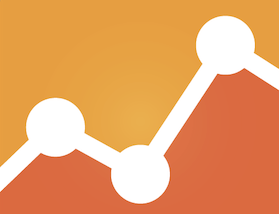 Many leading indicators are the default metrics in Google Analytics. It’s impossible to generate online sales without traffic, but all traffic is not equivalent. It is often second or third order behind the end goal of more sales. Yet most ecommerce companies obsess about it. A traffic loss might be a good thing, if high quality traffic replaces low quality. Oftentimes it’s worth segmenting leading indicators into more definitive metrics. As an example, it’s possible to build an advanced segment for traffic only in a local area for a bricks-and-clicks business. The key to the strategy is to consider the profile of the user that’s most likely to convert. It can allow a separation into high and low quality users. Diagnostic metrics are the “weeds” of website analytics. They are details that are very important, but looking at them without context can lead to poor decisions. Examples include bounce rates and quality scores. A high bounce rate on retail locator page might not be a bad thing, as users might have satisfied their intent of finding the location of a physical store. Conversely, a low bounce rate on a category page could still be too high as users might have seen no products at all that were appealing. There’s a simple question that can tell you if you’re in the weeds with a metric: How hard is it to explain its correlation to product sales? The more “whys” and “becauses” it takes to understand, the more likely is it that’s it’s weakly correlated, even if it’s eventually important. Consider a search-engine quality score, for example. How does quality score relate to sales? It causes a higher cost per click in search engine ads, which can make traffic more expensive, and force a high conversion rate to get an acceptable return. Thus the conversion rate can be a far more leading indicator than quality score. Focusing on the conversion rate in this case is a better use of energy. In my next post, I’ll address how to analyze transaction data to increase sales .